A collaborative research team, led by Drs. Craig Stow of the National Oceanic and Atmospheric Administration’s Great Lakes Environmental Research Laboratory (NOAA GLERL) and Mark Rowe of the University of Michigan’s Cooperative Institute for Limnology and Ecosystems Research (CILER), will be holding a workshop with key stakeholders for guidance on how a forecast model could help meet the needs for information on low oxygen conditions—or hypoxia—in Lake Erie. The workshop, coming up later this spring, kicks off a 5-year project that brings together inter-agency and university scientists to produce a forecasting system that will predict the location and movement of hypoxic water in Lake Erie. The project will link a hypoxia model to NOAA’s Lake Erie Operational Forecasting System (LEOFS) hydrodynamic model, which provides daily nowcast and 5-10 day forecasts of temperature and currents in Lake Erie. Hypoxia occurs in the central basin of Lake Erie in July through September of most years. 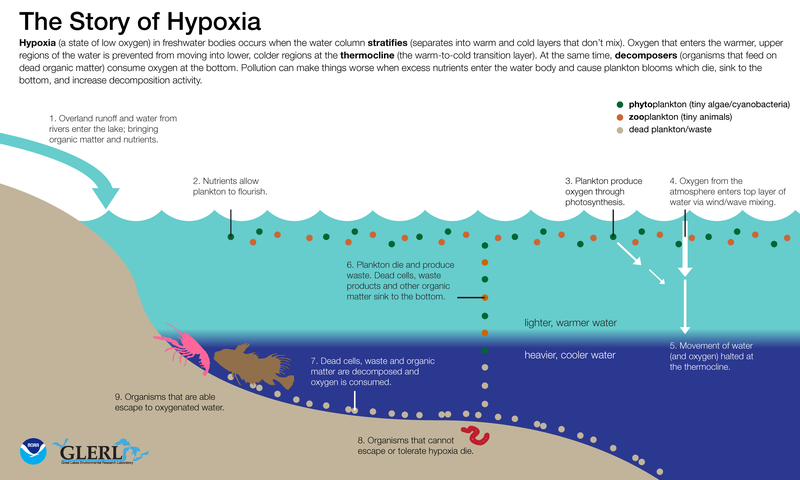 Low-oxygen water is an unfavorable habitat for fish, and may kill benthic organisms that provide food for fish. It is less well known, however, that hypoxic water can also upset drinking water treatment processes. Upwelling or seiche events can bring hypoxic water to water intakes along the shoreline, causing rapid changes in dissolved oxygen and associated water quality variables such as temperature, pH, dissolved organic matter, iron, and manganese. To maintain the quality of treated water, plant managers must adjust treatment in response to these changes. Hypoxia forecasts will provide several days advance notice of changing source water quality so that drinking water plant managers can be prepared to adjust treatment processes as needed. While the hypoxia forecasting project will help to minimize the negative impacts of hypoxia, a parallel effort is occurring to address the root cause of this problem involving nutrient loading. Universities, state, federal, and Canadian agencies are collaborating to satisfy the goals of the Great Lakes Water Quality Agreement by reducing nutrient loads to Lake Erie, a primary stressor driving hypoxic conditions. The upcoming stakeholder workshop on hypoxia will bring the research team together with stakeholders consisting of municipal drinking water plant managers from U.S. and Canadian facilities on Lake Erie, as well as representatives of state and local agencies. The group will learn about hypoxia and its effects, hear about the goals of the LEOFS-Hypoxia project, and provide input to the research team on their information needs. As the first in a series of meetings of the project’s Management Transition Advisory Group, this workshop will help identify the most useful data types and delivery mechanisms, laying the groundwork for the research team to design a forecasting tool that specifically addresses the needs of public water systems on Lake Erie. The workshop will be held at Cleveland Water in Cleveland, Ohio. Representatives from Ohio Environmental Protection Agency (EPA), Ohio Department of Natural Resources, Ohio Sea Grant, townships and other local governments were also invited to attend. The LEOFS-Hypoxia project is a collaboration with the City of Cleveland Division of Water, Purdue University, and U. S. Geological Survey, with guidance from a management advisory group including representatives from Ohio public water systems, Ohio EPA, Great Lakes Observing System (GLOS), and NOAA. The work is supported by a $1.4 million award from the NOAA National Centers for Coastal Ocean Science (NCCOS) Center for Sponsored Coastal Ocean Research by a grant to NOAA GLERL and University of Michigan (award NA16NOS4780209). As part of an initiative conducted under the auspices of the Great Lakes Water Quality Agreement, Annex 4, the following forums, led by Dr. Craig Stow at GLERL, will focus on the linkage of nutrient loading to water quality degradation problems, such as hypoxia and harmful algal blooms. Scientists attending these workshops will apply long term research results to estimate nutrient inputs to Great Lakes waters and evaluate how well we are doing in reaching phosphorus load reduction targets established under Annex 4 of the GLWQA. Categories: Communication, Event, Research | Tags: hypoxia, lake erie, Modeling, operations, Research, water quality | Permalink.